Atlantis is the fabled sunken city. First described by Plato in 360 BC, it has fascinated scholars and adventurers alike. To this day, its very existence is debated. It all depends on who you ask. Theories abound that place Atlantis anywhere from the Mediterranean to the Atlantic to just off the Florida Coast. However, the theories all agree on one important point. 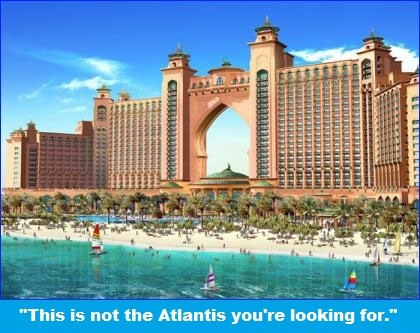 Atlantis is underwater. 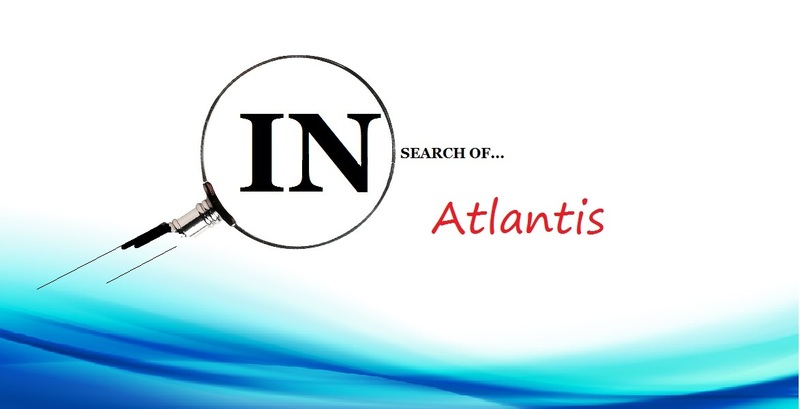 Atlantis has historically been hard to find. Before the age of underwater breathing apparatus, most of the explorers searching for Atlantis got to a depth of about twenty feet before they could hold their breath no longer and had to come up for air. The ancient philosopher Crantor wrote in his texts that “be it in humble surf or raging torrent, Atlantis is farther than I can throw a rock at a seagull. Oh brave seeker, row out a little farther than the end of the jetty.” One thing is for sure- Atlantis is farther out than you could comfortably wade, and most pleasant beaches have long been thoroughly explored, though that fact does nothing to discourage the may Atlantis seekers who get large grants and then spend the summer in the islands “searching for Atlantis” in the sun. Again, it depends on who you ask. 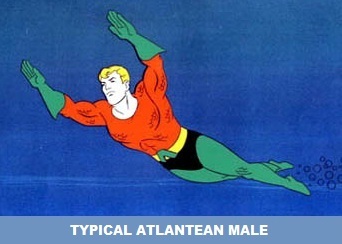 Classical mythology holds that Atlantis was a major naval power that conquered many cities. Other accounts hold that it was a center of arts and philosophy. Still other accounts claim that it was an inter-dimensional alien city. Trust me, what ever it was, it was not that. Theories abound, most of them a little kooky. They range from earthquakes and natural disasters to wrath of god or evil aliens, or, according to Nancy Pelosi, the Tea Party. (In her speech of July 2011, Ms. Pelosi said that “voting for the Republican debt plan is what sunk Atlantis.” New York Times) Most classical accounts claim that it took only a day to sink, which seems a little hasty. On the other hand, look at Pompei. Who were the people of Atlantis? Is there any proof of Atlantis? Are there other sunken cities? 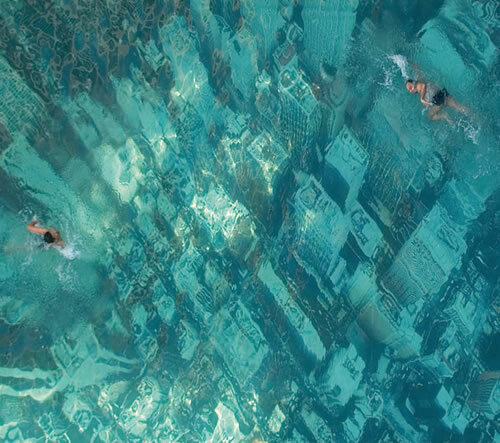 There are legends of many other sunken cities across the globe. Other than Atlantis, the most famous sunken city is R’lyeh. Noted explorer Howard Phillip Lovecraft and famed cartographer August Derleth have different opinions of R’lyeh’s location. Lovecraft said that R’lyeh is located at 47°9′S 126°43′W in the southern Pacific Ocean. August Derleth later placed R’lyeh at 49°51′S 128°34′W in his own writings. Both locations are close to the Pacific pole of inaccessibility (48°52.6′S 123°23.6′W), the point in the ocean farthest from any land. Derleth’s coordinates place the city approximately 5,100 nautical miles (9,400 km), or about ten days journey for a fast ship, from the real island of Pohnpei (Ponape). Pohnpei also plays a part in the Cthulhu Mythos as the place where the “Ponape Scripture”, a text describing Cthulhu, was found. It is recommended that sailors avoid R’lyeh as it is the home of the evil god Cthulhu. R’lyeh is sometimes referred to in the ritualistic phrase “Ph’nglui mglw’nafh Cthulhu R’lyeh wgah’nagl fhtagn”, which roughly translates to “In his house at R’lyeh dead Cthulhu waits dreaming”. Do you have any final words about Atlantis? Either Atlantis is a sunken city rich in gold and ancient artifacts or Plato was full of it. The truth is probably somewhere in between. Assuming Atlantis was real, it was most likely a slum. Leave it alone. ← HA! Now you know how it feels! Cool post. And one of the greatest lines in one of the greatest stories of all time is “In his house at R’lyeh . . .” That scene where Cthulhu comes out after the sailors has some of the best writing ever. Also–there was a very old movie about Atlantis that portrayed them as an advanced civilization with some sort of ray gun laser thing. The city was destroyed by an earthquake or volcano as i recall. Some people who believe that movie think that Atlantis was in the Atlantic off the coast of Bermuda (where apparently there are underwater ruins) and that the Bermuda Triangle is caused by the ray gun still functioning. Thanks for not mentioning the Donovan song! The only Donovan song I know well is Sunshine Superman. As for Lovecraft, I love almost everything he wrote. In fact I just reread At the Mountains of Madness a couple of weeks ago. My personal vision of Atlantis is straight out of old Republic serials, clunky robots and guys in tin foil helmets. I keep coming back to Lovecraft, too. I think my favorite is “Shadow Over Innsmouth.” I just realized that R’lyeh is fairly close to NZ. “Shadow” is my second favorite HPL story. The Case of Charles Dexter Ward is probably first. And stay away from mysterious islands. I haven’t read that one and it isn’t in any of the anthologies I have. I found a version on the internet and I’ll have a look–thanks! It doesn’t make many anthologies because of its length. I have it as a self-contained novel. It is a little like Dracula- in style- at times. & a lot of people believed firmly in its existence, most notably Hitler, the Nazis, & Aryan supremacists who believed it was the homeland of the Aryan race, unfortunately. The Nazis took a number of Hindu -Buddhist symbols, adapted them & used them in their propaganda. Not exactly Atlantis, but also a form of Utopia – especially to Nazis, apparently. For a lot of reasons, (none very apparent) this particular In Search Of is very different from past installments, chiefly in the way it was written. There were a lot of ways I could have gone, from the Hollow Earth to Thule to The Kingdom of Prester John but I stuck to my throughline. ISO is not an easy blog to write. There is a reason there was such a big wait since the last one. But yes, there is a ton of material out there. And Shambhalla? Nice song. Shambhalla is / was similar to Shangri – La, the paradisical land portrayed by Frank Capra in the movie ” Lost Horizons “, based on the novel by Hilton. 1 myth even has Tibetan monks taking some of its most sacred relics to an island in the S. China Sea ( In the Philippines ). All this according to an expert ( ? ) on the SyFy Channel series ” Legend Quest “. I now have that song stuck in my head. Good thing I like it. There was a video of some New Agers travelling through Northern India set to ” Shambhala ” on YouTube. It was by a group called Lotus Tours. There was also a program 20 – 25 something years ago on ” Arthur C. Clarke’s Mysterious World ” about the real location of Atlantis being somewhere in or near deserted Incan ruins in the Andes. Don’t ask me the logic behind that one. I haven’t read much on the subject in years but I remember reading some odd theories that put Atlantis in a biblical context and placed the city somewhere inland too. To me it comes down to the “fact” the ancient Greeks were relating some badly recalled myths that were ancient even in their time and any “facts” about Atlantis are innaccurate. If you go back to even older mythology- Babylonian, Sumerian- the myths get seriously weird. I think that some people believe that the Great Pyramid & its 2 siblings on the Giza Plateau were built using designs & principles from Atlantis, & there’s some kind of storehouse of ancient, arcane mystical knowledge but that pseudo – scientific thinking has been around for quite a LONG TIME. I think there is enough hard evience and solid theory to be pretty certain how the pyramids were built. We know where the stones came from and how they were moved, and very logical and possible theories with evidence behind them about how they may have been constructed, none of which needed Atlantean help. I find the question of why they were built more interesting. It is pretty clear that there is an astrological component behind them. I don’t buy that people spending the night inside the pyramid had visions and other-worldly experiences. I think those people got out just what they brought in. However, I do think there are more things about the pyramids than are generally known. The guy running the antiquities (or used to, I don’t know what’s up with it now) in Egypt has always been close-mouthed about information and tight-fisted about access to the pyramid. That said, I am surprised that with all the modern technology available we don’t already have complete interior scans of the pyramid. You’d think that with all the junk floating in space somebody would have turned one satellite on the Great Pyramid already. If things are to be believed, we know more about the hearts of some neutron stars than that constuct. Yeah, the whole Atlantean semi – mystical method adopted for building pyramids is GREAT – IF you’re a New Ager type person who also believes that all the gods of EArth’s past were based on extra – terrestrial visitors, etc. He also wrote about the Titanic. Maybe in 3 – 500 years, the Titanic will become a legend / myth like Atlantis, Utopia, Shambhalla, the Taoist Isles of the Blessed, Avalon, etc. Who knows ? & the Pyramids & Stonehenge will still be there centuries after the remains of the fabled ship are just a series of mysterious deposits of oxidation on the N. Atlantic seabed. Out of all those sort of places, the only one I’ve been to is Stonehenge and it really is remarkable. It is really just in the middle of nowhere, nothing around but fields of sheep, and not a lot of commercialization, other than a gift shop. I didn’t sense anything mystical about it, and of course we couldn’t touch it, but only a rope kept us us at a respectable distance. I’ll dig up some pics for a future Picture Postcard. My step – sister traveled to Egypt about 3 decades ago before I even knew her. She was in the Grand Gallery in the heart of the Great Pyramid. There are no hieroglyphs in the entire construct except for one left in soot ( ? ) by a work gang commemorating their completion of the burial chamber at the top. New Agers have paid beaucoup dollars to get INTO the unoccupied sarcophagus & meditate, hoping to have a mystical experience of some kind. Not my step – sister, though. Don’t know if she still has any photographs. I didn’t know anyone could actually get inside that until I saw it on An Idiot Abroad, which for my money is the best travel show ever. Any group or individual with the proper authorization can be allowed access, ingress & egress into the Great Pyramid. My step – sister also saw the city of Petra in Jordan & the ruins of Pompeii. Some groups think that such access to such monuments & places should be limited only to groups of conservationists, archeologists & historians. Some people think that Pompeii shouldn’t be visited at ALL, because contact destroys the detailed frescos & such. Some Hollywood celebrity even purchased furniture smuggled out of the ruins of Pompeii, only to have it destroyed in a fire in the Hollywood area later. Very cool. Your step-sis has been to some great places. Aside from Stonehenge, the closest I’ve been to any of those places was the British Museum, with some amazing antiquities like the Rosetta Stone. Well, she had connections. One of her uncles was a Christian tour director, so she had a substantial discount in regard to overseas travel. Good for her. None of my uncles was ever much of a connection. When I graduated college, one of my uncles put his arm around my shoulder, said let’s take a walk, and instead of slipping me some money asked me if I wanted to borrow his car. I did not. If you can do it, travel is the best thing you can do. I want to travel to see famous naturist beaches all over the planet before I shake off my mortal coil ( Bearing in mind that there are SOME people at nudist beaches & colonies who should stay ** clothed ** 😉 ). My wife is VERY interested in Aquaman’s home. It’s cool that you are too!